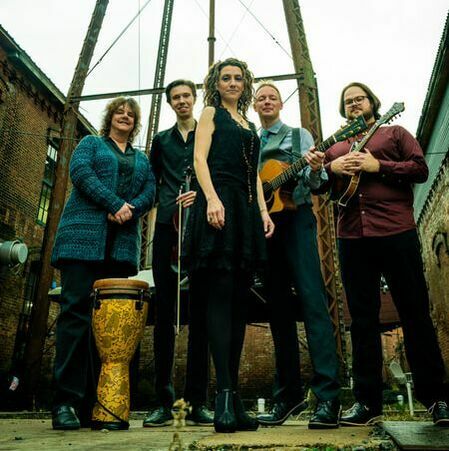 Quickly gaining recognition as a “super-group,” RUNA has been enchanting audiences by pushing the boundaries of Irish folk music into Americana and roots music since their formation in 2008. Interweaving the haunting melodies and exuberant tunes of Ireland and Scotland with the lush harmonies and intoxicating rhythms of jazz, bluegrass, flamenco and blues, they offer a thrilling and rede- fining take on traditional music. The backbone of the band’s signature sound stems from the musical and geographical diversity and individual achievements of its members: Shannon from Philadelphia, Dublin-born Fionán, Cheryl from Montreal, Zack from St. Louis and Maggie from Hopkinsville, Ky. Their creativity has earned them a reputation as one of the most innovative Irish folk groups of this generation. RUNA was named the Top Group and Top Traditional Group in the Irish Music Awards and received four Independent Music Awards. including Best Live Album, Best World/Traditional Song and Best Bluegrass Song. Their fifth album, “RUNA: LIVE,” released in 2016, has been praised on both sides of the Atlantic and hailed as “an incredible masterpiece” by The Celtic Crier.